Next week is WPPB’s On Air Pledge Drive (October 5th - October 10th). During this pledge drive, we want to expand our audience and are turning to our loyal listeners to enlist your help. Tell your friends, family and colleagues about Long Island’s Only LOCAL NPR Station and why their support is essential. WPPB brings you 8,760 hours each year of the best local and national public radio programs, including 70 hours a week of locally produced music, news and community interest programming, and 50 hours of special interest programs from independent national producers. Not to mention, NPR and PBS coverage of national news, business, arts, culture, health, science and technology. We cover a world of ideas including an eclectic collection of music, books, travel, pets, health, nutrition, space exploration and sports. Click here to donate online now. We are asking our listeners to use their social media networks to spread the word about WPPB. Please post the copy provided below on your Facebook and Twitter Accounts. It’s quick and an easy way to reach out to new listeners! Encourage your friends to visit our homepage at 883wppb.org and to pledge if they want to show their support for this NPR member station! We also encourage you to donate now to help secure Long Island’s Only LOCAL NPR Station! Pledge Now! Help to Support Long Island's Only NPR Station! It's WPPB's Fall Pledge Drive. Make Your Donation Now at http://bit.ly/1e8s9AM! Pledge Now! 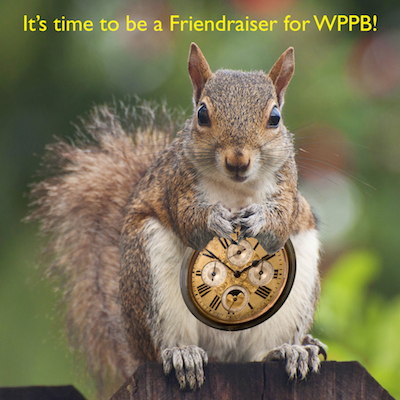 Help to Support WPPB, Long Island's Only NPR Station at http://bit.ly/1e8s9AM!